The Pathways Center is more than just a resource and source of support for the bereaved, it is also a resource to others who support the bereaved — extended family, friends, clergy, therapists, school personnel and employers. Anyone can contact us for more information about the following options. The Pathways Center for Grief & Loss offers online grief education 24/7 to meet you at your own time at your own place. The Composing Life Out of Loss videos provide education about the grief journey while virtual meetings provide an opportunity for those who would like to meet with a counselor but unable to do so due to distance or schedule. Contact us to schedule a virtual meeting with our counselor. The Pathways newsletter is published every other month and contains information about the natural grief process, as well as upcoming support groups and educational opportunities. For a current issue, click here. Books, magazines, professional journals, videos, DVDs and audiotapes on a wide variety of grief-related topics are available. These materials are helpful to both the bereaved and those seeking to support them. Materials are also available in Spanish. The library is open Monday through Friday, 8:00 a.m.–5:00 p.m.
Educational opportunities have been designed to address a variety of needs. Small and concise, this booklet is a useful tool for all school personnel. 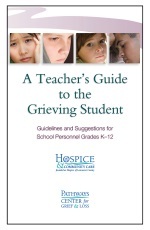 Contents include common reactions to grief according to developmental stages, various types of losses, guidelines and specific suggestions, questions for adults to reflect upon regarding their own grief experiences, a bibliography of books and articles for children and adults and other grief resource options. For an order form, click here. The Pathways Center for Grief & Loss provides handouts, bibliographies and a list of grief-related websites on coping with serious illness, grief and loss. Click here for a listing. The Pathways Center staff is available to provide resources and direction for those who may be facing unique situations. Please contact us for more information or individual attention to your need. For more information, call (717) 391-2413 or (800) 924-7610.